The death of the DVD continued in 2009, and it can’t come soon enough for me. Those wretched round devils have destroyed a small boy’s sense of wonder. 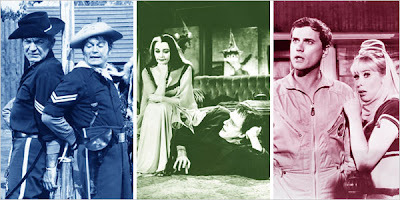 Then these beloved old shows — “F Troop,” “The Munsters” and the rest — started showing up on DVD, making it possible to watch them in super slow motion, even frame by frame. And the boy, now grown, has begun to realize that many of his foundational memories were just tricks of the eye. So hurray that home DVD sales appear to be on their way to another decline in 2009. It’s imperative that these things disappear from the marketplace before any more old television series are digitized. Some shows were never intended for the DVD microscope. My road to disillusionment started with the opening collage of my favorite show of that era, “F Troop,” an ABC sitcom about a fort full of goof-offs and goofballs on the Indian-plagued frontier just after the Civil War. The show, which ran from 1965 to 1967, had a great theme song like many series in that period. (“Where Indian fights are colorful sights and nobody takes a lickin’; where paleface and redskin both turn chicken.”) Among the images that flashed by as the song played was a sequence in which charging Indians shoot arrows, and then the show’s main characters, Sergeant O’Rourke (Forrest Tucker) and Corporal Agarn (Larry Storch), are seen on the parapet, an arrow whizzing into each man’s hat. Alas, the loathsome DVD tells a different story. Watching the sequence in super slow motion, it is clear that O’Rourke and Agarn already had arrows in their hats in the first frame. Mr. Tucker and Mr. Storch simply jerked their heads backward to create the illusion that the arrows had just struck. Boy do I feel stupid. That discovery tripped a switch in my head; when a man realizes he has been lied to, he wants to know how often, and by whom. So lately I’ve been taking a slow DVD journey through my childhood. Turns out I was lied to a lot. By almost everybody. “F Troop” didn’t stop with the optical illusion of the introduction. There was, for instance, “Our Hero, What’s His Name,” an episode in which Agarn falsely brags to his girlfriend that he has killed Geronimo, and a newspaper trumpets the story. Geronimo hears about it and hunts Agarn down, intent on killing him. He backs Agarn against a wall and starts throwing knives at him, a half-dozen or so. We see Mr. Storch against the wall, knives thwacking into the wood just inches from his flesh. To a mid-’60s kid it was a stunning example of a brave actor putting his life on the line for a role. To a 2009 grownup with a remote in his hand, it’s more depressing proof that the world runs on deceit: a frame-by-frame examination reveals the knives to be popping out of the wall from behind, not being thrown into it by a fearsome Indian chief. My shame at my own gullibility knows no bounds. And let’s not even talk about Wrangler Jane, the most enchanting cast member of “F Troop,” played by a lovely teenager named Melody Patterson. Jane, a tender but tough frontier gal, was a sharpshooter who would sometimes blast bottles out of midair. On DVD the strings holding those bottles are clearly visible. Oh Jane, how could you? Another beguiling woman was camped out over on NBC: the title character of “I Dream of Jeannie” (1965-70), a centuries-old genie played by Barbara Eden. Jeannie, by folding her arms and blinking her eyes, could make things appear and disappear. Humph. More lies. Right from the start. In the pilot, “The Lady in the Bottle,” broadcast in September 1965, an astronaut named Tony Nelson (Larry Hagman) ends up on a deserted island after his space flight is aborted. He finds a bottle, and in the bottle is a luscious genie, whom he asks to conjure up something that might rescue him. And she does: first a Viking-like ship, which pops up on what had been an empty ocean, then a helicopter, which materializes in the middle of the sky where no helicopter had been before. These vessels don’t sail or fly into view; they are there in, literally, an eye blink, as if teleported to the spot. Like magic. But, in slow-mo, it is evident that the power to summon transportation equipment belonged not to the genie named Jeannie, but to a film editor, one who knew that in those days before high definition and rewind it wouldn’t take much to fool the rubes in the audience. Before the ship appears, the sea has a notable wave; when the ship pops into view, that wave is gone. The cloud formation in the helicopter-free sky shifts markedly when the helicopter suddenly appears. With that kind of subterfuge in the first few minutes of the pilot, am I really supposed to believe that any of the goings-on in the subsequent 138 episodes were the work of a genuine genie? I’m also sorry to report that, contrary to my memories, Herman Munster did not have the power to reverse the laws of physics. Herman (Fred Gwynne) was the father in “The Munsters” (1964-66), a sitcom about a ghoulish-looking family trying to assimilate into suburbia. In the episode “Family Portrait” Herman peers into a diner, scaring the bejabbers out of the customers. One man’s hat goes flying off his head straight up.